Transponder Card Tags are hands-free, long range active tags used for personnel and asset identification. The card can be worn as a lanyard or clipped to clothing and is powered by an internal battery. Each card has a unique signal which allows them to be tracked and identified individually. Operational card life is estimated at 3-5 years depending on use, application and environment. ZoneSafe utilizes advanced identification and detection technologies, audible alarms, flashing lights and management software to help increase awareness and visibility. The system utilizes RFID technology, which creates an invisible 360-degree protection & detection zone around equipped vehicles (or other assets). This can be referred to as the "collision zone". The system uses detection antennas, single/multiple zones, and variable detection ranges (3 to 9 meters). Many different configurations can be created. 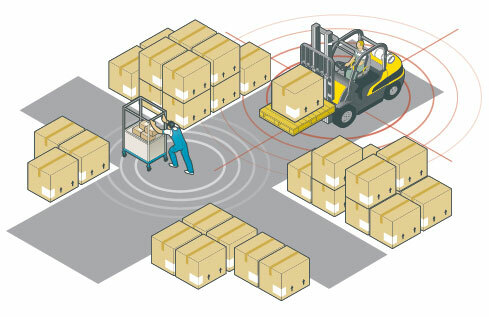 The control unit is installed on each forklift/vehicle, along with proximity detection antennas. Each pedestrian in the protected operation wears a pedestrian transponder tag, which can be integrated into a jacket or vest, worn on a convenient lanyard, or simply carried in a pocket. When a pedestrian enters the protected area (you can define ranges) near a vehicle, the control unit emits both an audible and visible alert, alerting the driver that a pedestrian is nearby. Once the pedestrian leaves the monitored zone, the alarm ceases. This dynamic is similar for non-pedestrian applications, as vehicles can be configured to sense each other. 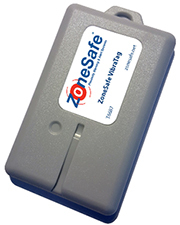 Control hardware such as gates or wall-mounted alarms and lights can also detect and react to a vehicle's presence when equipped with ZoneSafe technology. How serious are the risks of forklift/pedestrian collisions? There are about 100 deaths every year in the United States due to forklifts, along with tens of thousands of injuries, many involving pedestrians being struck or crushed by a forklift. See our white paper Shared Space is Dangerous Place for details.